The following remarks are from Rev. Erik Christensen, who was invited to address the ELCA Conference of Bishops during their meeting last weekend. Rev. Christensen was given voice in the meeting and asked to respond to their deliberations regarding a potential rite for pastors who were extraordinarily ordained and credentialed by Extraordinary Lutheran Ministries. With just a few moments to prepare, Rev. Christensen offered these words. (Rev. 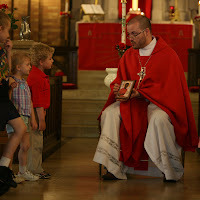 Christensen pictured at left, leading worship at St. Luke’s Lutheran Church of Logan Square, where he serves). Good afternoon, my name is Erik Christensen. I’m a pastor here in Chicago at St. Luke’s Lutheran Church of Logan Square. I did my candidacy in the Southeastern Iowa Synod. I’m a son of St. John’s Lutheran Church in Des Moines, Iowa. And I did my seminary training both at Candler School of Theology at Emory, but also at the Lutheran Theological Seminary at Philadelphia. I interned on the Jersey Shore at Holy Cross Lutheran Church in Toms River. I want to say it’s really wonderful to be asked to speak. I really thank you for recognizing the privilege that it is to be allowed to speak to all of you and I thank you for extending that privilege. And I just want to say what you all know is true, but if I say it, it makes it a little less true for me in the moment…this is scary (laughter). So I just needed to say that so I could have permission to shake a little bit in my shoes. I’ve often been afraid of what bishops think about the work that we do in ELM. And often I’ve been afraid because the way that our relationship has worked out historically has not been so good. But I really enjoy being in the room for the conversation right now because it builds my trust in the shared commitment to the Gospel that all of us have. And I can hear the sensitive, and the probing, and the discerning questions that are being asked, and it builds my trust in the church that we are becoming together. A lot has been said, a lot has been written about the authority by which ELM has understood its ordinations to take place. So I actually don’t want to say too much about that at this particular moment, because I’m hearing a lot of that language filtering into your conversation. It’s really clear that this room of brothers and sisters has a really strong grasp on the myriad precedents, and that precedent alone isn’t really what we’re discussing here. And so I’ll be happy to entertain any questions, and others would as well, about that question of authority and by what authority we did those ordinations. But I think most of those points have been raised by you in these conversations already. The contribution I want to make at this point in the conversation is to this question, “Why ordination?” Or why not ordination? How important is that word, really? And he said, “No. That would be a broken ordination.” And I was confused. And so, I welcome the laying on of hands. I welcome the blessing with oil and with prayer and with every other form of public blessing that this church has to offer and I don’t think that “ordination” is the right word for that. Because I’ve been ordained. And you’ve been ordained. And our ordinations have been broken. And the healing and the reconciliation that needs to take place right now is contextual. And I’m not ignorant to the fact that ordination is a word…it’s so nice to hear that there are these four different words, there are plenty of other words and they are not understood the same way at all moments in the life of the church and the history of the church. And so in one sense, “don’t get too hung up on it.” It’s ordination, it’s not ordination. But at this moment in the church, and in this context, it’s a word that does have importance. It’s a word that does have meaning, now, for us. And so, if the purpose of the rite that you are trying to craft, if the purpose of this moment is to announce reconciliation and healing, then it will be important what word you choose. Not because that word always means that thing and always has meant that thing, but because you want that word to do something right now. And if you want it to do that thing, if you want the word, if you want the rite to do that thing that is healing and reconciliation in the body, that heals my broken ordination and your broken ordination, then affirm the ordinations that we’ve received. Affirm the calls that we’ve received. Let’s bless one another in this ministry together. This entry was posted on Friday, March 19th, 2010 at 2:23 pm	and is filed under Blog. You can follow any responses to this entry through the RSS 2.0 feed. Both comments and pings are currently closed.